Cambridge vinyl cladding from Mitten Vinyl Australia recently played a key role in production of the Australian movie ‘Tomorrow When the War Began’, released in cinemas soon. DULUX D ES lamps from OSRAM Australia can help to reduce energy consumption by up to 10%. Panasonic Australia will bring Australian businesses into the High Definition videoconferencing era with the introduction of a new High Definition Visual Communications System. Available from Smoke Control, Fibershield EI fully insulated fire curtains provide -/60/60 without water supply and are tested in accordance with AS1503.4 and AS1905.2. The SPLASH! Environmental Awards for the swimming pool, spa and aquatics industries were recently presented at a gala dinner on the Gold Coast in late July 2010. 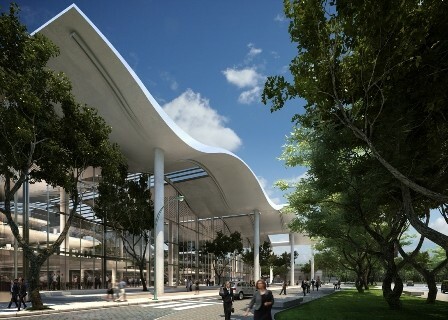 Foster + Partners, working with construction firm, CRIBA S.A. and local architect, BBRCH-Minond, has won the competition to design a new corporate headquarters for the Banco Ciudad de Buenos Aires, Argentina. An innovative pavilion in front of Sydney's Customs House will explore how fabric can change the scope of people's engagement with architecture. 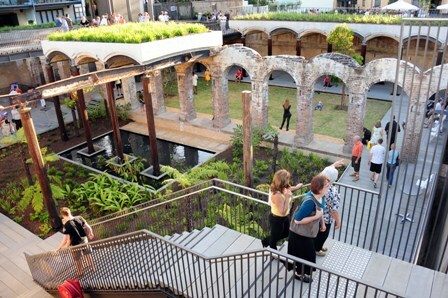 The Paddington Reservoir Gardens restoration project in Sydney has received the Australian Institute of Landscape Architects (AILA) 2010 Australian Medal for Landscape Architecture. BlueScope Steel has launched a new website to help tradespeople work with steel framing made from Truecore steel. ACO Polycrete offers POWERDRAIN trench drains, a range of high performance drains designed for heavy duty applications. Blum staff recently welcomed guests to Design in Motion, a gala event held on the 20th August 2010. As the population expands in Victoria, Boral’s brick production has also recovered from the extensive damage to one of its major Victorian sites.